Grapes have been grown in Mailly for centuries, since before the building of Reims Cathedral in the 13th Century. Mailly wines were much appreciated by the church and nobility- gracing all of the finest tables from the Middle Ages onward. Mailly winegrowers have witnessed the landmark events that shaped French History, contributing to the rising fortunes of Champagne in the 17th Century. Mailly Champagne was classified Grand Cru in 1920. The exceptional quality of Mailly grapes comes from the areas chalk subsoil that regulates soil temperature and humidity, and hillside plantings that enjoy full exposure to the sun. Only 17 of Champagnes 319 villages currently enjoy Grand Cru status. The fruit they produce is rare and expensive and usually reserved for the finest Champagne cuvees. Mailly Grand Cru is the only Champagne House to source all of its wines from Grand Cru vineyards. Mailly Grand Cru Brut Vintage is made only in the very finest years, harvested from selected plots of the Mailly Grand Cru estate. This is a Champagne you can lay down for 20 years and still enjoy at its best. It is a blend of 75% Pinot Noir and 25% Chardonnay, with only 6g of sugar per dosage. 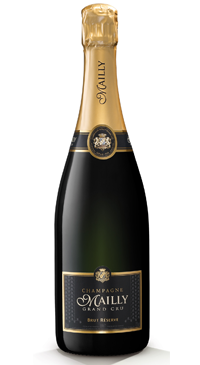 Brilliant, burnished gold colour with orange highlights punctuated by a fine, delicate effervescence. The nose has all the intensity of great vintage years with refined, complex notes of pears, nectarines, grapes, mandarins and almonds. On the palate, flavours of ripe fruits are supported by a lovely mineral edge combining smoothness and fullness with distinction and purity.